New stadium: Have you met the Burmese triplets? Thanks to a recent visit by famous groundhopper Frank Jasperneite, we can today show you the modern stadium in Mandalay, Myanmar. But what’s most interesting about it is not the Mandalar Thiri Stadium itself, rather the fact that there are two almost identical stadia built not far away. 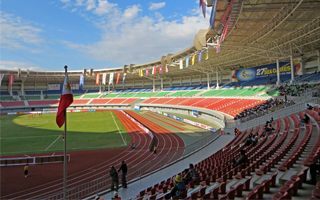 Now, before we get to Myanmar (not personally, sadly), let us note that cases of more than one stadium built along the same design aren’t exceptional. In Europe you find the twins of Middlesbrough / Derby County or Paderborn / Gliwice. Also, due to China’s expansive “stadium diplomacy”, some venues built in Africa have their exact equivalents in China. However, the Burmese case doesn’t entirely fit among the above examples. First of all, usually using the same design goes along at least minor structural and/or aesthetic changes. Here it's only the shade of the roofs, not even the seating layout! Secondly, It’s the only case we know of, in which not two, but three venues were built along the same documentation. And thirdly, we’ve never seen such “siblings” so connected to one-another. The connection includes both location (two of them are in the famous ghost-metropolis of Naypyidaw, third just 200km north), time frame (two were built in 2010-2012 and third in 2011-2013) and purpose. All of them were built for the 2013 Southeast Asian Games.